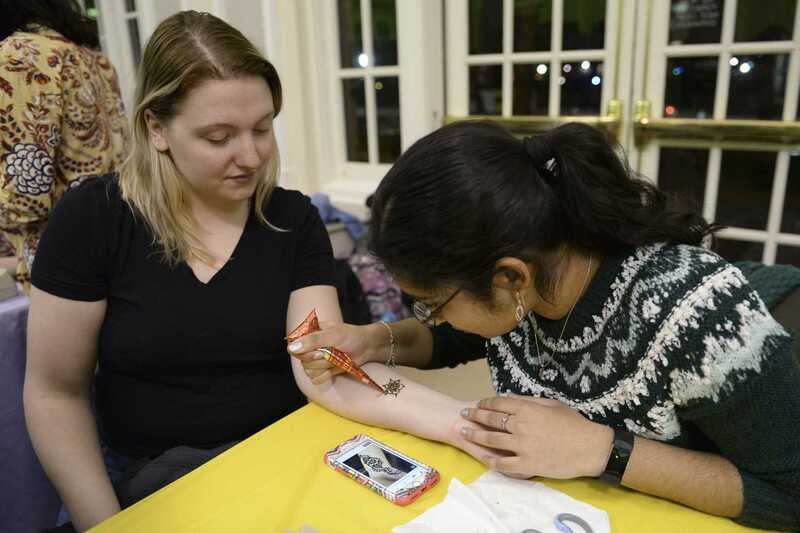 As the doors of the William Pitt Union lower lounge opened at 8 p.m., about 150 students poured in to learn about the experiences of women in other countries. The event, Who Run the World?, was part of Pitt’s annual Women’s Empowerment Week hosted by Student Government Board. The week will see several events throughout the week about women’s empowerment, with this one focusing on international aspect of female empowerment. Students visited booths put together by various student organizations, such as Pitt Global Ties, Girl Up, the Asian Studies Center and the University Center for International Studies — all organizations related to international programs at Pitt. Participants could also join in on salsa and belly dancing lessons. Sarah LaBouliere, a junior communication and English major, represented Girl Up — an organization founded by the United Nations Foundation to educate and empower girls around the world — at one of the tables. LaBouliere got involved with Girl Up in the spring of 2016 when the Pitt chapter was founded. Girl Up was involved in last year’s Women’s Empowerment Week, co-sponsoring a film viewing for “Girl Rising,” which follows the stories of girls in countries the organization is involved in. “We knew we wanted to have a bigger hand this year, and we brainstormed this event because we’re so focused on countries around the world and womanhood and girlhood, and we thought, ‘What if we could get other organizations involved?’” LaBouliere said. They succeeded in bringing other groups aimed at global empowerment to participate this year, such as Global Ties. Madhu Mahesh, a junior psychology and gender, sexuality and women’s studies major, and Lucy Chiem, a senior psychology major, represented Global Ties, which hosts cultural immersion trips allowing both international and domestic students to visit different locations within the United States. Past trip destinations included Denver, Washington, D.C., and Lancaster. “We do a lot of global and culturally aware programming, and they reached out to us to talk about the global and international culture things on campus that can pertain to women.” Mahesh said. Global Ties also hosts speakers from organizations within Pitt to bring awareness to the cultural opportunities and resources that are available. “For international students, sometimes they don’t really know where to start for various resources, and so we open the doors to that,” Mahesh said. Jennie O’Donaghue, a senior urban studies and Spanish major, attended the event as an ambassador for the UCIS, which grants certificates to students who have studied specific regions of the world, including Asia, Africa and Europe. O’Donaghue is completing a certificate in Latin American studies. She has studied abroad and completed internships through the program. Though she knows most people get involved with the certificate programs early in their college careers, she didn’t join until she was a junior. She has had no problem with the certificate and said some students might not know they’ve even completed one. “It’s actually pretty common to accidentally complete a certificate,” she said. The University Center for International Studies was asked to attend the event because of its international theme. Aubrey Masters, a sophomore studying pre-social work, attended because she is a member of sorority Delta Zeta — which belongs to the Collegiate Panhellenic Association, a Greek life collective that co-sponsors Women’s Empowerment Week.